Description: This beautiful filigree cross is made by the River City Rubber Works Company. This image is just the right touch for any Inspirational card. 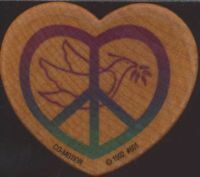 Description: This is a unique heart shaped peace symbol with a dove and olive branch. Size: Image size is 1 5/8" x 1 1/2"